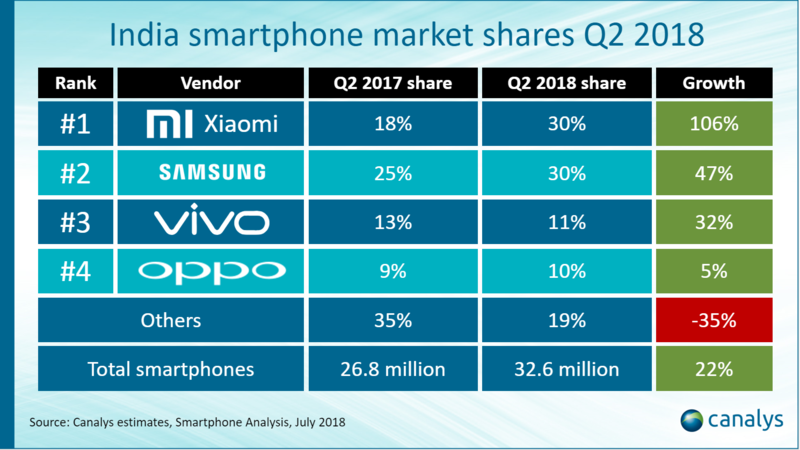 Palo Alto, Shanghai, Singapore and Reading (UK) – Thursday, July 7 2018: Samsung and Xiaomi each shipped 9.9 million smartphones to India last quarter. This is the best quarter either vendor has had in the country. Together, the two companies now account for 60% of total shipments in India, up from 43% a year ago. Xiaomi more than doubled its shipments, albeit from a modest base, just putting it in first place. Samsung’s annual growth rate, at nearly 50%, was the best it’s been since Q4 2015, leaving it hair’s breadth behind Xiaomi in second place. Vivo took third place while Oppo came fourth, with shipments of 3.6 million and 3.1 million respectively. In line with these spectacular performances, overall shipments grew by 22%, to just under 33 million units.